Deryn is a Welsh name. It means "bird". She`s a beautiful little bird except that she has very ragged tail feathers. Because she and Eleri are the smallest birds in the cage, one of them is bumped off the perch when somebody wants more elbow room. Climbing back up the side of the cage, if she encounters another bird, she has to back down and she catches her tail on the bars of the cage. 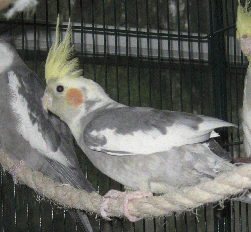 Deryn was one of a large flock of cockatiels rescued from a back-yard breeding situation where the birds were not kept in good conditions. She is very nervous around people, if the people are up close, but as long as we keep our distance, she chirps and calls out with the other tiels.